2017 – Visit to listen to accompanying podcast. Reposted with permission. Children the world over are fascinated with what can possibly “fit” in their orifices. Diagnosis is often delayed. Anxiety abounds before and during evaluation and management. Set the scene and control the environment. Limit the number of people in the room, the noise level, andminimize “cross-talk”. The focus should be on engaging, calming, and distracting the child. Quiet room; calm parent; “burrito wrap”; guided imagery; have a willing parent restrain the child in his or her lap – an assistant can further restrain the head. Most foreign bodies in the ear, nose, and throat in children can be managed with non-pharmacologic techniques, topical aids, gentle patient protective restraint, and a quick hand. Consider sedation in children with special health care needs who may not be able to cooperate and technically delicate extractions. Ketamine is an excellent agent, as airway reflexes are maintained.3 Remember to plan, think ahead: where could the foreign body may be displaced if something goes wrong? You may have taken away his protective gag reflex with sedation. Position the child accordingly to prevent precipitous foreign body aspiration or occlusion. The external auditory canal. Foreign bodies may become lodged in the narrowing at the bony cartilaginous junction.4 The lateral 1/3 of the canal is flexible, while the medial 2/3 is fixed in the temporal bone – here is where many foreign bodies are lodged and/or where the clinician may find evidence of trauma. If there is an insect in the external auditory canal, kill it first. They will fight for their lives if you try to dismember or take them out. “In the heat of battle, the patient can become terrorized by the noise and pain and the instrument that you are using is likely to damage the ear canal.”5,6 Use lidocaine jelly (preferred), viscous lidocaine (2%), lidocaine solution (2 or 4%), isopropyl alcohol, or mineral oil. Vegetable matter? Don’t irrigate it – the organic material will swell against the fixed structure, and cause more pain, make it much harder to extract, and may increase the risk of infection. Failure to inspect after removal – is there something else in there? Do not push a foreign body down the back of a patient’s throat, where it may be aspirated into the trachea. Be sure to inspect the palate for “vacuum effect”: small or flexible objects may be found on the roof of the mouth, just waiting to be aspirated. Go to BLS maneuvers if the child decompensates. Infants under 1 year of age – back blows: head-down, 5 back-blows (between scapulae), 5 chest-thrusts (sternum). Reassess, repeat as needed. Children 1 year and up, conscious – Heimlich maneuver: stand behind patient with arms positioned under the patient’s axilla and encircling the chest. The thumb side of one fist should be placed on the abdomen below the xiphoid process. The other hand should be placed over the fist, and 5 upward-inward thrusts should be performed. This maneuver should be repeated if the airway remains obstructed. Alternatively, if patient is supine, open the airway, and if the object is readily visible, remove it. Abdominal thrusts: place the heel of one hand below the xiphoid, interlace fingers, and use sharp, forceful thrusts to dislodge. Be ready to perform CPR. Children 1 year and up, unconscious – CPR: start CPR with chest compressions (do not perform a pulse check). After 30 chest compressions, open the airway. If you see a foreign body, remove it but do not perform blind finger sweeps because they may push obstructing objects further into the pharynx and may damage the oropharynx. Attempt to give 2 breaths and continue with cycles of chest compressions and ventilations until the object is expelled. Chest films are limited: 80% of airway foreign bodies are radiolucent.11 Look for unilateral hyperinflation on expiratory films: air trapping. 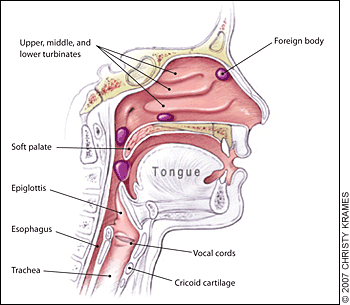 Most esophageal foreign bodies in children occur at the level of the thoracic inlet / cricopharyngeus muscle (upper esophageal sphincter). Other anatomically narrow sites include the level of the aortic arch and the lower esophageal sphincter. This is an emergency: the electrolyte-rich mucosa conducts a focal current from the narrow negative terminal of the battery, rapidly causing burn, necrosis, and possibly perforation. Emergent removal is required. 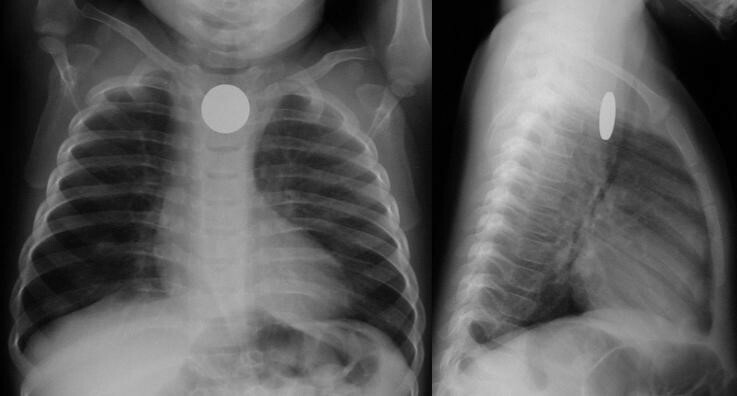 Button batteries that have passed into the stomach do not require emergent intervention – they can be followed closely. Not a button battery, not a sharp object, not a long object? If there is no obstruction, consider revaluation the next day – may wait up to 24 hours for passage.14 Sharieff et al.15 found that coins found in the mid to distal esophagus within 24 hours all passed successfully. What conditions prompt urgent removal? History is essential. Believe the parents and assume there is an aspirated/ingested foreign body until proven otherwise. History of choking, has persistent symptoms and/or abnormal xray? Broncoscopy! Cohen et al.16 found that of 142 patients evaluated at a single site university hospital, 61 had a foreign body. Of the 61 patients, 42 had abnormal physical exams and radiographs and 17 had either abnormal physical exams or radiographs, and 2 had normal physical exams and radiographs, but both had a history of persistent cough. Bottom line: history of choking PLUS abnormal exam, abnormal films, or persistent symptoms, evaluate with bronchoscopy. A single household magnet will likely pass through the GI tract, with the aforementioned dimensional caveats. Two or more magnets, however, run the risk of attraction and trans-bowel wall pressure necrosis. It’s best to keep your armamentarium as large as you can. 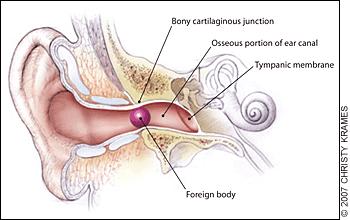 A small foreign body in the lateral 1/3 of the auditory canal may be amenable to a simple curettage. Hair beads (if the central hole is accessible) may be manipulated out with the angled tip of a rigid curette. Steady the operating hand by placing your hypothenar eminence on the child’s zygoma or temporal scalp, to avoid jutting the instrument into the ear canal with sudden movement. There is a large selection of disposable simple and lighted curettes on the market. Various eponymous hooks are available for this purpose; one in popular use is the Day hook, which may be passed behind the foreign body.22 An inexpensive and convenient alternative to the commercially available right-hooks is a home-made version: make your own by straightening out a paperclip and bending it to a right angle23 at 2-3 mm from the end (be sure not to use the type that have a friable shiny metallic finish, as the residue may be left behind in the ear canal). If it is completely lodged, use of a right-angle hook will likely only cause trauma to the canal. Alligator forceps are best for grasping soft objects like cotton or paper. Smooth, round or oval objects are not amenable to extraction with alligator forceps. When using them, be sure to get a firm, central grip on the object, to avoid tearing it into smaller, less manageable pieces. Pro tip: Look before you grip! Be careful to visualize the area you are gripping, to avoid pulling on (and subsequently avulsing) soft tissue in the ear canal. Apply cyanoacrylate to either side of a long wooden cotton swab (the lecturer prefers the cotton tip side, for improved grip/molding around object). Immediately apply the treated side to the object in the ear canal in a restrained patient. Steady the hypothenar eminence on the child’s face to avoid dislodgement of the cotton swab with sudden movement. Apply the treated swab to the foreign body for 30-60 seconds, to allow bonding. Slowly pull out the foreign body. 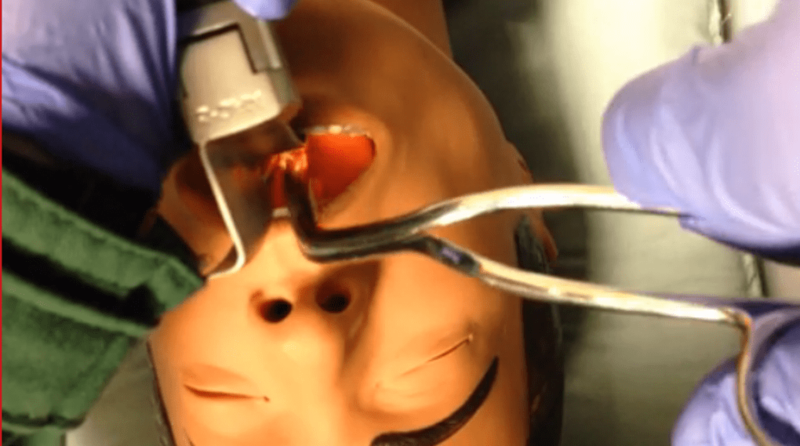 Re-visualize the ear canal for other retained foreign bodies and abrasion or ear canal trauma. Did the cyanoacrylate drip? Did the swab stick to the ear canal? Irrigation is the default for non-organic foreign bodies that are not amenable to other extraction techniques. Sometimes the object is encased in cerumen, and the only “instrument” that will fit behind the foreign body is the slowly growing trickle of water that builds enough pressure to expulse it. Do not use if there is any organic material involved: the object will swell, causing much more pain, difficulty in extraction, and possibly setting up conditions for infection. Position the child either prone or supine, gently restrain (as above). Let gravity work for you: don’t irrigate in decubitus position with the affected ear up. It may be more accessible to you, but you may never get the foreign body out. To use a butterfly needle: use a small gage (22 or 24 g) butterfly set up, cut off the needle, connect the tubing to a 30 mL syringe filled with warm or room-temperature water. Insert the free end of the tubing gently, and “secure” the tubing with your pinched fingers while irrigating (think of holding an ETT in place just after intubation and before taping/securing the tube). Gently and slowly increase the pressure you exert as you irrigate. 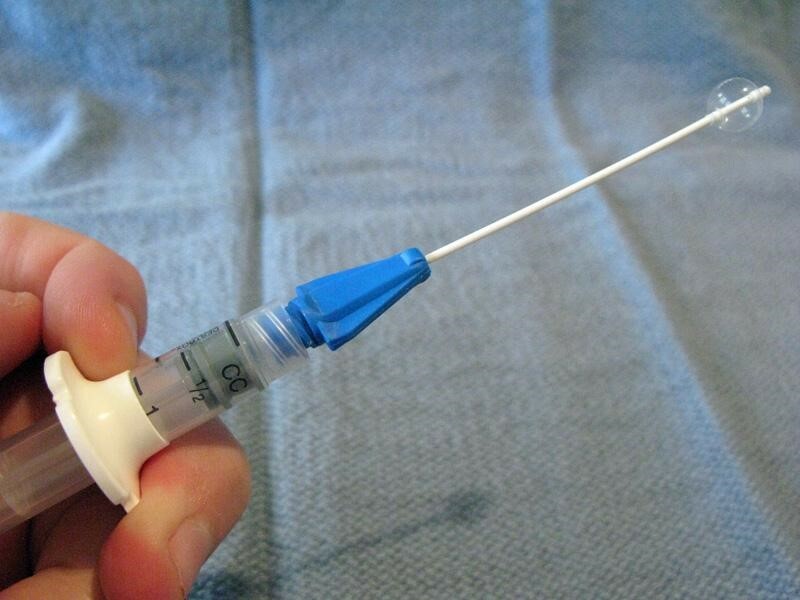 To use an IV or angiocatheter: use a moderate size (18 or 20 g) IV, remove the needle and attach the plastic catheter to a 20 mL syringe, and irrigate as above. Acetone has been used successfully to remove chewing gum, Styrofoam, and superglue from the ear canal24,26,27 Use in cases where there is no suspicion of perforation of the tympanic membrane. Cerumen is composed of sebaceous ad ceruminous secretions and desquamated skin. Genetic, environmental, and anatomical factors combine to trap a foreign body in the external canal. Use of a ceruminolytic such as docusate sodium may help to loosen and liberate the foreign body.28 Caveat medicus: Adding docusate sodium will make the object more slippery – this may or may not be an issue given the nature of the foreign body. In the case where loosening the ear wax may aid extraction (and will not cause a slippery mess), consider filling the ear canal will docusate sodium (Colace), having the child lie with the affected side up, waiting 15 minutes, and proceeding. This is especially helpful when planning for irrigation. Rare earth magnets (a misnomer, as their components are actually abundant) such asneodymium can be useful in retrieving metallic foreign bodies (e.g. button batteries in the nose or ears).29,30 Magnetic “pick-up tools” – used by mechanics, engineers, and do-it-yourselfers – are inexpensive and readily available in various sizes, shapes, and styles such as a telescoping extender. Look for a small tip diameter (to fit in the ear canal as well as the nose) and a strong “hold” (at least a 3-lb hold). Bottom line: if it’s metal, it’s worth a try to use a magnet. Even if the metal is very weakly magnetic, the strong neodymium magnet may still be able to exert a pull on it and aid in extraction. 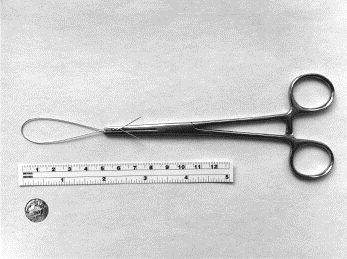 A relatively new method, described by Fundakowski et al.32 consists of using a small length of 24-gauge (or similar) wire (available inexpensively online, and kept in your personal “toolkit”; see Appendix B below) to make a loop that is secured by a hemostat (the 24-gauge wire is easily cut into strips with standard trauma scissors). After treatment with oxymetolazone (0.05%) and lidocaine (1 or 2%) topically, the loop is passed behind the foreign body (in the case report, a button battery). Pull the loop toward you until you feel that it is sitting up against the button battery. Now, turn the hemostat 90° to improve your purchase on the foreign body. Pull gently out. This technique is especially useful when the foreign body has created marked edema, either creating a vacuum effect or making it difficult for other instruments to pass. Small-caliber devices (5, 6, or 8 F) originally designed for use with intravascular or bladder catheterization may be used to extract foreign bodies from the ear or nose.7,33 A catheter designed specifically for foreign body use is the Katz extractor. Inspect the ear or nose for potential trauma and to anticipate bleeding after manipulation (especially the nose). Deflate the catheter and apply surgical lubricant or 2% lidocaine jelly. Insert the deflated catheter and gently pass the device past the foreign body. Inflate the balloon and slowly pull the balloon and foreign body out. Re-inspect after extraction. This technique is an approximation of the above mother’s kiss technique – useful for unwilling parents or unsuccessful tries.10,25 The author prefers to position the child sitting up. A self-inflating bag-mask device is fitted with a very small mask: use an abnormally small mask (otherwise inappropriately small for usual resuscitative bag-mask ventilation)to fit over the mouth only. Choose an infant mask that will cover the child’s mouth only. Occlude the opposite nostril with your finger while you form a tight seal with the mask around the mouth. Deliver short, abrupt bursts of ventilation through the mouth – be sure to maintain good seals with the mask and with your finger to the child’s nostril – until the foreign body is expulsed through the affected nostril. 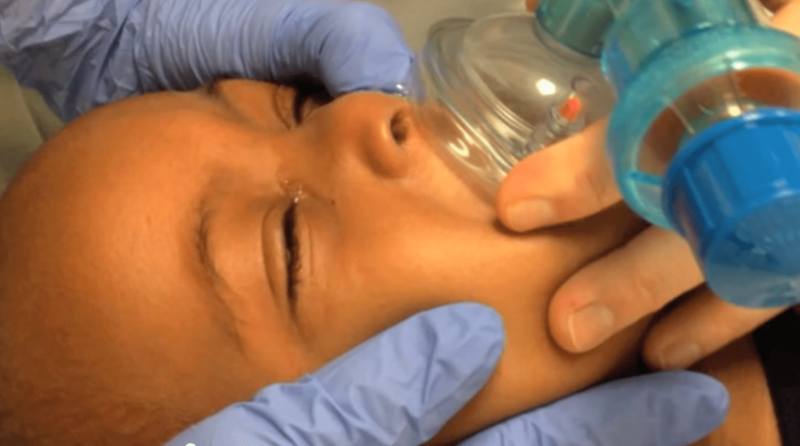 For the very uncooperative child with a nasal foreign body amenable to positive pressure ventilation who fails the mother’s kiss and bag-mask technique, a continuous positive pressure method may be used. Connect one end of suction tubing to the male adaptor (“Christmas tree”) of an air or oxygen source. Connect the other end of the suction tubing to a male-to-male adaptor (commonly used for chest tube connections or connecting / extending suction tubes). Insert the end of the device into the child’s unaffected nostril. The air flow will deliver positive pressure ventilation continuously. With this technique there is a theoretical risk of barotrauma to the lungs or tympanic membranes. However, there is only one case reported in the literature of periorbital subcutaneous emphysema. Optimize your visualization with a nasal speculum. The nostrils, luckily, will accommodate a fair amount of distention without damage. 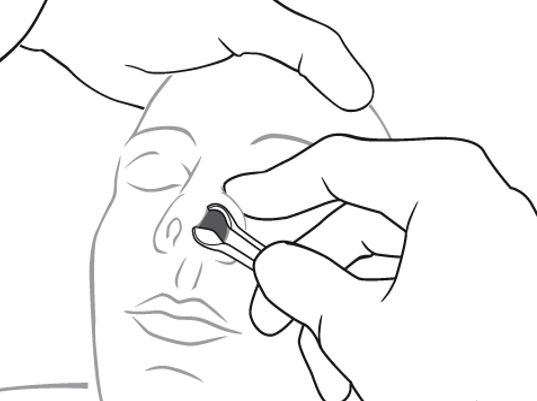 Hold the speculum vertically to avoid pressure on and damage to the vessel-and-nerve-rich nasal septum. Hold the handle of the speculum in the palm of your hand comfortably and while placing your index finger on the patient’s ala. This will help to control the speculum and your angle of sight. Your other hand is then free to use a hook or other tool for extraction. Lighting is especially important when using the nasal speculum: a focused procedure light or head lamp is very helpful. The author keeps a common camping LED headlamp in his bag for easy access. Various commercial and non-commercial suction devices are on the market for removal of foreign bodies. All connect to wall suction, and vary by style, caliber of suction, and tip end interface. A commonly available suction catheter is the Frazier suction tip (right), a single-use device used in the operating room. A modification to suction can be made with the Schuknecht foreign body remover (left; not to be confused with the suction catheter of the same name): a plastic cone-shaped tip placed on the end of the suction catheter to increase vacuum surface area and seal. If a child aspirates and occludes his airway, return to BLS maneuvers (as above). If the child becomes obtunded, use direct laryngoscopy to visualize the foreign body and remove with the Magill forceps. Hold the laryngoscope in your left hand as per usual. Hold the Magill forceps in your right hand – palm side down – to grasp and remove the foreign body. At the end of the visit, after some rapport has been established, counsel the caregivers about age-appropriate foods and “child-proofing” the home. This is a teachable moment – and only you can have this golden opportunity! Although molars (required for chewing) erupt around 18 months, toddlers need to develop coordination, awareness to eat hard foods that require considerable chewing. An abbreviated list: use age-appropriate toys and “test” them out before giving them to your child to verify that there are no small, missing, or loose parts. Secure medications, lock up cabinets (especially with chemicals), do not store chemicals in food containers, secure the toilet bowl, and unplug appliances. Best overall tip: get down on all fours and inspect your living area from the child’s perspective. It is amazing what you will find when you are least expecting it. Although your institution should supply you with what you need to deal with routine problems, we all struggle with having just what we need when we need it. High-volume disposable items such as cyanoacrylate (Dermabond), curettes, supplies for irrigation, alligator forceps, and the like certainly should be supplied by the institution. However, some things come in very handy as our back-up tools. NB: we should be cognizant of the fact that tools that must be sterilized or autoclaved are not good candidates for our personal re-usable toolkits. Chapin MM, Rochette LM, Annest JL, Haileyesus T, Conner KA, Smith GA. Nonfatal Choking on Food Among Children 14 Years or Younger in the United States, 2001–2009. Pediatrics. 2013;132(2):275-281. doi:10.1542/peds.2013-0260. Committee on Injury V. Policy Statement—Prevention of Choking Among Children. Pediatrics. 2010:peds.2009-2862. doi:10.1542/peds.2009-2862. Brown L, Denmark TK, Wittlake WA, Vargas EJ, Watson T, Crabb JW. 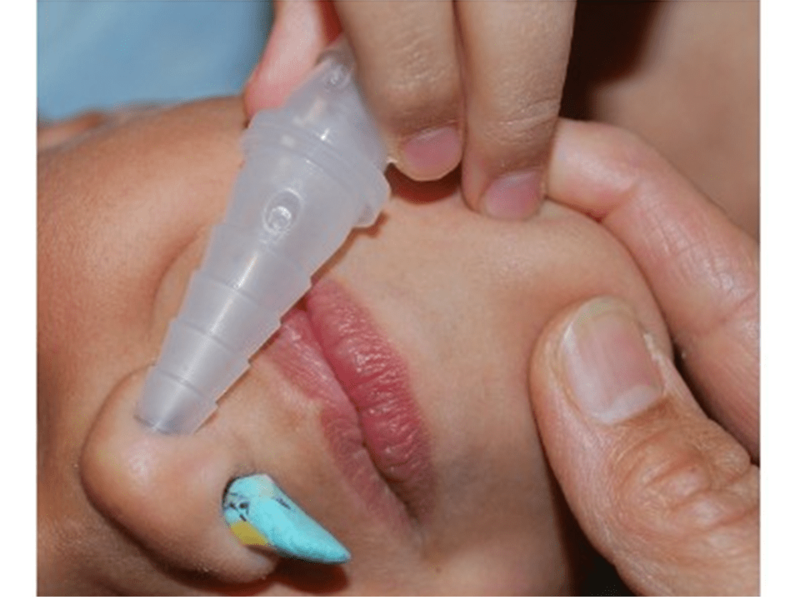 Procedural sedation use in the ED: management of pediatric ear and nose foreign bodies. Am J Emerg Med. 2004;22(4):310-314. Heim SW, Maughan KL. Foreign bodies in the ear, nose, and throat. Am Fam Physician. 2007;76(8):1185-1189. DiMuzio J, Deschler DG. Emergency department management of foreign bodies of the external ear canal in children. Otol Neurotol Off Publ Am Otol Soc Am Neurotol Soc Eur Acad Otol Neurotol. 2002;23(4):473-475. Leffler S, Cheney P, Tandberg D. Chemical immobilization and killing of intra-aural roaches: an in vitro comparative study. Ann Emerg Med. 1993;22(12):1795-1798. Kiger JR, Brenkert TE, Losek JD. Nasal foreign body removal in children. Pediatr Emerg Care. 2008;24(11):785-792; quiz 790-792. doi:10.1097/PEC.0b013e31818c2cb9. Kadish HA, Corneli HM. Removal of nasal foreign bodies in the pediatric population. Am J Emerg Med. 1997;15(1):54-56. Tahir N, Ramsden WH, Stringer MD. Tracheobronchial anatomy and the distribution of inhaled foreign bodies in children. Eur J Pediatr. 2009;168(3):289-295. doi:10.1007/s00431-008-0751-9. Rempe B, Iskyan K, Aloi M. An Evidence-Based Review of Pediatric Retained Foreign Bodies. Pediatr Emerg Med Pract. 6(12). Digoy GP. Diagnosis and management of upper aerodigestive tract foreign bodies. Otolaryngol Clin North Am. 2008;41(3):485-496, vii – viii. doi:10.1016/j.otc.2008.01.013. Loren Yamamoto, Inaba A, DiMauro R. Radiologic Cases in Pediatric Emergency Medicine; University of Hawaii. Radiol Cases Emerg Med. http://www.hawaii.edu/medicine/pediatrics/pemxray/zindex.html. Accessed February 20, 2015. Painter K. Energizer makes button battery packages safer for kids. USA Today. ASGE Standards of Practice Committee, Ikenberry SO, Jue TL, et al. Management of ingested foreign bodies and food impactions. Gastrointest Endosc. 2011;73(6):1085-1091. doi:10.1016/j.gie.2010.11.010. Sharieff GQ, Brousseau TJ, Bradshaw JA, Shad JA. Acute esophageal coin ingestions: is immediate removal necessary? Pediatr Radiol. 2003;33(12):859-863. doi:10.1007/s00247-003-1032-4. Cohen S, Avital A, Godfrey S, Gross M, Kerem E, Springer C. Suspected Foreign Body Inhalation in Children: What Are the Indications for Bronchoscopy? J Pediatr. 2009;155(2):276-280. doi:10.1016/j.jpeds.2009.02.040. Haliloglu M, Ciftci AO, Oto A, et al. CT virtual bronchoscopy in the evaluation of children with suspected foreign body aspiration. Eur J Radiol. 2003;48(2):188-192. doi:10.1016/S0720-048X(02)00295-4. Jung SY, Pae SY, Chung SM, Kim HS. Three-dimensional CT with virtual bronchoscopy: a useful modality for bronchial foreign bodies in pediatric patients. Eur Arch Otorhinolaryngol. 2011;269(1):223-228. doi:10.1007/s00405-011-1567-1. Hussain SZ, Bousvaros A, Gilger M, et al. 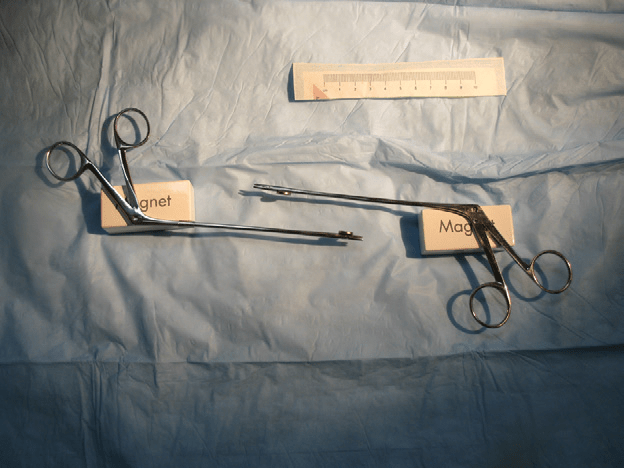 Management of ingested magnets in children. J Pediatr Gastroenterol Nutr. 2012;55(3):239-242. doi:10.1097/MPG.0b013e3182687be0. Brown JC, Otjen JP, Drugas GT. 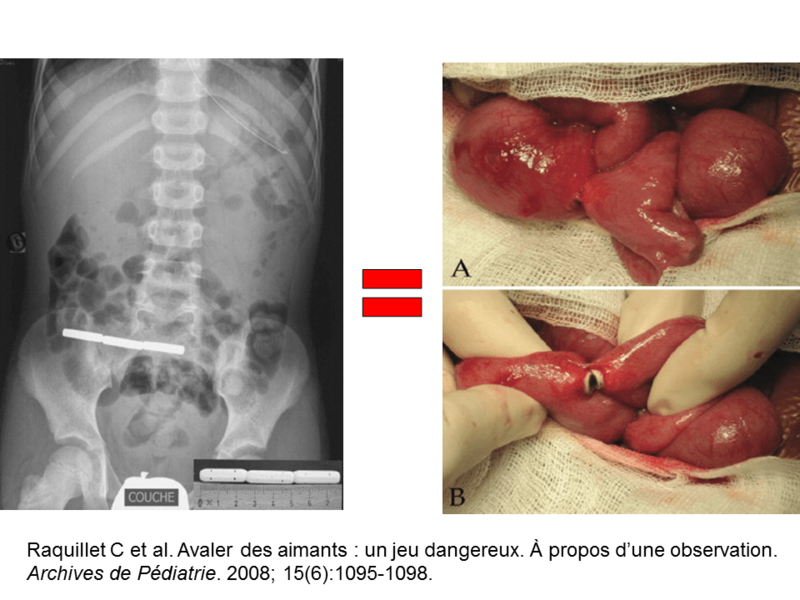 Too attractive: the growing problem of magnet ingestions in children. Pediatr Emerg Care. 2013;29(11):1170-1174. doi:10.1097/PEC.0b013e3182a9e7aa. Brown JC, Otjen JP, Drugas GT. Pediatric magnet ingestions: the dark side of the force. Am J Surg. 2014;207(5):754-759; discussion 759. doi:10.1016/j.amjsurg.2013.12.028. Menner AL. Pocket Guide to the Ear: A Concise Clinical Text on the Ear and Its Disorders. Thieme; 2011. Colina D, Dudek S, Lin M. Tricks of the Trade: ENT Dilemmas – How Do I Get That Out of There? ACEP News. http://www.acep.org/Clinical—Practice-Management/Tricks-of-the-Trade–ENT-Dilemmas—How-Do-I-Get-That-Out-of-There-/?__taxonomyid=118010. Published July 2009. Accessed February 5, 2015. Abadir WF, Nakhla V, Chong P. Removal of superglue from the external ear using acetone: case report and literature review. J Laryngol Otol. 1995;109(12):1219-1221. Kadish H. Ear and Nose Foreign Bodies “It is all about the tools.” Clin Pediatr (Phila). 2005;44(8):665-670. doi:10.1177/000992280504400803. Chisholm EJ, Barber-Craig H, Farrell R. Chewing gum removal from the ear using acetone. J Laryngol Otol. 2003;117(4):325. doi:10.1258/00222150360600995. White SJ, Broner S. The use of acetone to dissolve a Styrofoam impaction of the ear. Ann Emerg Med. 1994;23(3):580-582. Singer AJ, Sauris E, Viccellio AW. Ceruminolytic effects of docusate sodium: a randomized, controlled trial. Ann Emerg Med. 2000;36(3):228-232. doi:10.1067/mem.2000.109166. Bledsoe RD. Magnetically adherent nasal foreign bodies: a novel method of removal and case series. Am J Emerg Med. 2008;26(7):839.e1-e839.e2. doi:10.1016/j.ajem.2008.01.036. Dolderer JH, Kelly JL, Morrison WA, Penington AJ. FOREIGN-BODY RETRIEVAL USING A RARE EARTH MAGNET: Plast Reconstr Surg. 2004;113(6):1869-1870. doi:10.1097/01.PRS.0000119869.01081.1C. Yeh B, Roberson JR. Nasal magnetic foreign body: a sticky topic. J Emerg Med. 2012;43(2):319-321. doi:10.1016/j.jemermed.2010.02.013. Fundakowski CE, Moon S, Torres L. The snare technique: a novel atraumatic method for the removal of difficult nasal foreign bodies. J Emerg Med. 2013;44(1):104-106. doi:10.1016/j.jemermed.2012.07.070. Chan TC, Ufberg J, Harrigan RA, Vilke GM. Nasal foreign body removal. J Emerg Med. 2004;26(4):441-445. doi:10.1016/j.jemermed.2003.12.024. Cook S, Burton M, Glasziou P. Efficacy and safety of the “mother’s kiss” technique: a systematic review of case reports and case series. Can Med Assoc J. 2012;184(17):E904-E912. doi:10.1503/cmaj.111864. Gregori D, Morra B, Snidero S, et al. Foreign bodies in the upper airways: the experience of two Italian hospitals. J Prev Med Hyg. 2007;48(1):24-26. This post and podcast are dedicated to Linda Dykes, MBBS(Hons) for her can-do attitude and collaborative spirit. Thank you for sharing your knowledge, experience, and heart with the world.